Weight gain is a natural and common thing during pregnancy. Not much one can do about it when a child’s health and well-being is at stake. However, this doesn’t mean that you have an excuse to gorge yourself. Excessive weight gain is always critical, especially for mothers-to-be. There may be several reasons for excessive weight gain. One of the most common is overeating. There’s a special center in our brain – the hypothalamus, which regulates the sense of hunger. When a person begins to overeat systematically, a failure occurs in the work of the hypothalamus. Low mobility is the second reason. Weakness in labor, the risk of having an overdue baby. There’s no such thing as “perfect weight” when a mother is expecting since it’s individual for everyone. It depends on the body mass index, which can be calculated according to the following formula: divide your body weight (in kilograms) into your height (in square meters). A normal index is considered to be 19,8-25,9. The lower the index of body mass is, the more you can gain within 10-14 kg. If you’re expecting twins – add 2,3-4,6 kg to the number mentioned before. Usually, pregnant women gain about 40% of the total weight gain during the first half of the pregnancy and 60% in the second. It’s often observed that initially thin women gain more weight during pregnancy – and they are entitled to it because they make up for their physiological deficit of mass. A pregnant woman’s diet should include 100-120 grams of protein a day. This amount should include approximately 70-90 g of animal-based protein (milk, cottage cheese, kefir, fermented baked milk, yogurt, eggs, meat, and fish). The daily quantity of fats (all fats that come with food are considered) is 80-100 g, 20 g of which are of plant origin. Carbs should not exceed 350-400 g per day. 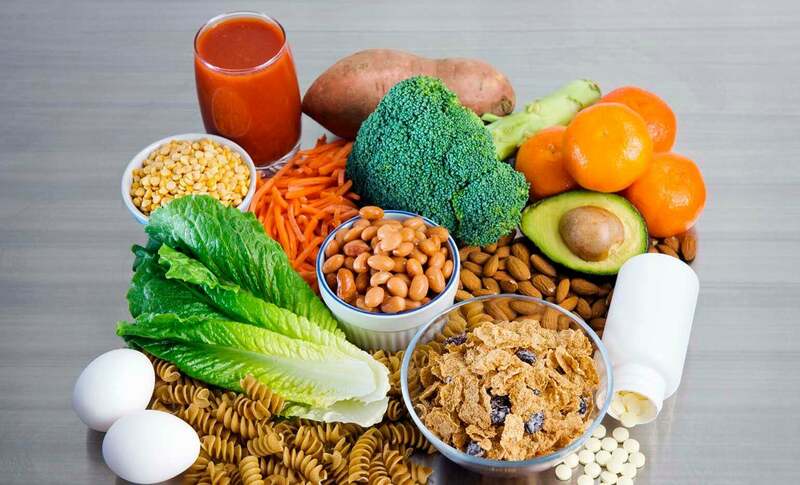 It is necessary to reduce the number of carbohydrates in the second part of pregnancy to 300 grams a day by reducing the amount of bread, flour products, sugar and increasing the number of proteins. Bread and flour products: 100-150 grams a day. This amount includes wheat bread (slightly dried), diet salt-free bread, bread with bran, rye bread and biscuits. Soups: a serving up to 200 g daily. Vegetable soups with a little potato, cereals, and pasta. Soups can be garnished with cream, low-fat sour cream, and chopped greens. Meat and meat products: no more than 150 g a day. Preferably low-fat varieties of beef and veal, rabbit meat and poultry (chicken, turkey – without skin), steamed cutlets, rolls, meatballs, steam puddings. Beef stroganoff with boiled meat is allowed. Fish: low-fat kinds – no more than 150 grams a day. Codfish, icefish, pikeperch, trout, and others can be boiled or steamed, fish cutlets, dumplings, fish puree, rolls, etc. Milk and milk products (if there are no allergies or lactose intolerance): whole milk – up to 200 grams a day. Milk can be added to tea, porridge, soups. Non-fat cottage cheese (100-200 grams a day), low-fat kefir or curdled milk, low-fat and unsweetened yogurts (also 100-200 g a day). Eggs: 1-2 a week – soft-boiled, poached eggs, steamed omelets. Fats: unsalted butter, including ghee. Vegetable oils are allowed only as an addition to meals, no more than 15 grams per day. Vegetables: all varieties of cabbage, fresh cucumbers, zucchini, pumpkin, tomatoes, bell pepper, lettuce. It’s better to eat fresh vegetables. Kohlrabi, carrots (boiled carrots are allowed in limited quantity), green peas, beans, radish, beets, green onions, dill, parsley. Fruits and berries: sweet and sour varieties, fresh or cooked. Drinks: tea with milk; unsweetened fruit juices made with berries and vegetables, diluted with boiled water, dogrose tea. Sweets: are not recommended in case of excessive weight gain. Freshly baked bread, products made with butter and puff pastry, pastries, cakes, chocolate, gingerbread, and other confectioneries. Condensed milk, milkshakes, ice cream. Cheeses and sour-milk products with a high-fat content, sweet yogurts, puddings, cheesecakes, and others. Fast food (a big no-no). Fatty varieties of meat and fish, lard, goose’s meat, ducks, internal organs of animals (liver, kidneys), brains, smoked products, sausages, canned food. Herring, salted and smoked fish, caviar. Fried and deep fried food. Sweet kinds and of fruits and berries (grapes, melons, pears, bananas). An expectant mother’s diet excludes any alcoholic drinks, refined sugar. The most important thing to avoid becoming overweight is to follow a balanced diet. 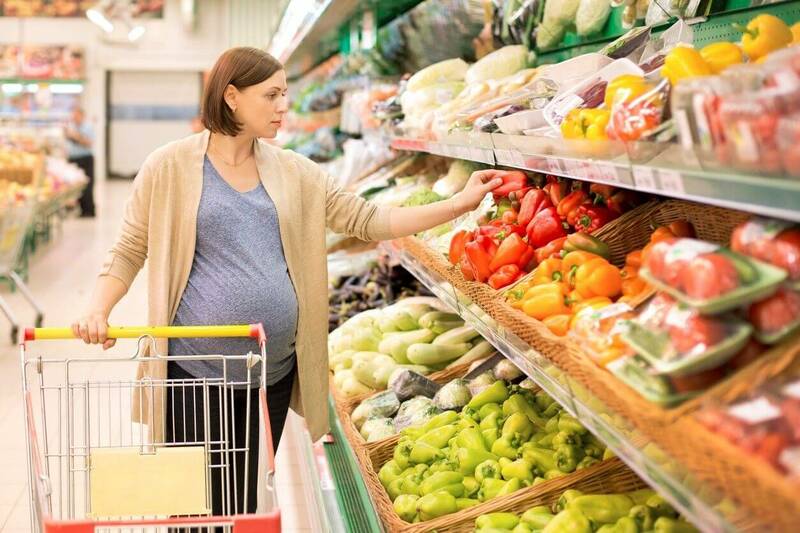 Pregnancy is perhaps the most favorable period to learn to eat healthily. The main foods should be fresh vegetables and fruits, as well as steamed. Make sure that the food you eat is of high quality. Try to eat as little fried food as possible, avoid greasy food. Eat moderately (often, but in small portions, you can drink a glass of water before each meal). Don’t be a veggie, avoid low mobility.